Livebaiting is one of my favourite ways of fishing. For many years I often fished for pike with live fish as bait because the method always seemed to produce more and (usually) bigger fish than most other tactics. Pike fishing allowed me to refine my methods to the use of a single circle hook, an approach which I've now adapted for sea fishing. Of course one of the main problems is catching bait when you need it and this is just as tricky in the sea as in the river or lake. Last week my pal Dave was down in Dorset for a few days holiday and we decided to try piking. The river was still high and a little bit coloured but it looked pretty good. Dave opted to spin for sea trout and I wanted to have a go with a bait for pike. 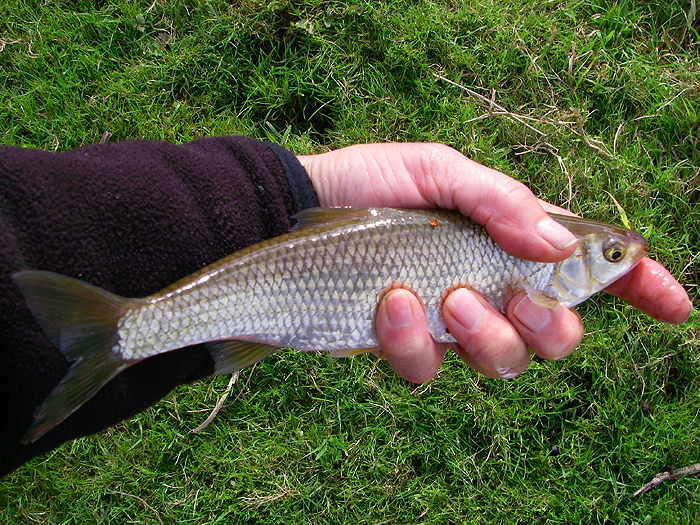 I began by float fishing with maggots and it was probably five or ten minutes before the fish showed any interest, then I had a big dace. This was soon followed by another three, all smaller, but that was enough (more than enough as it turned out) for the pike session so we set off down the River. There's no point dwelling on the trip because (unusually) neither of us had a bite of any description. Don't ask me why - I was really disappointed considering the conditions. Fortunately Dave had a couple of good bassing sessions while he was on his holiday but it was a few days before I was able to go myself. This time I went to the sea in hopes of a bass but, apart from no wire trace and a larger circle hook, the tackle was identical to the pike gear. First I had to catch a bait. I started well before sunrise and it was probably a quarter-of-an-hour before I had a bite. 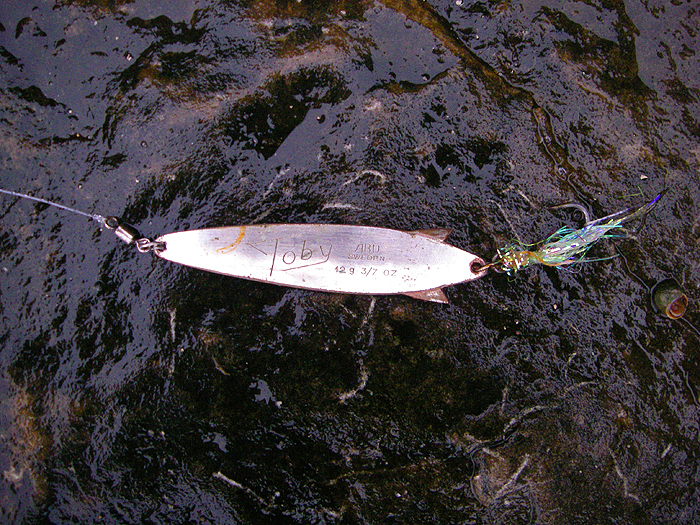 Anyway, the single-hooked Toby was eventually taken and I soon had a lively mackerel ready to be lip-hooked on the circle hook. 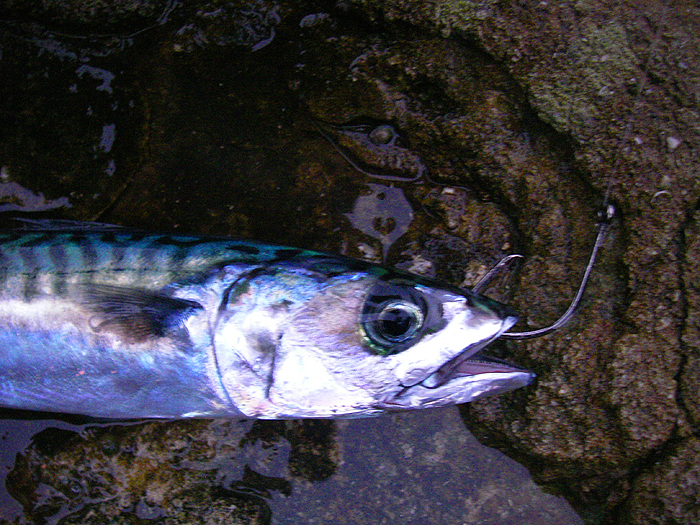 For a good half-hour I worked my freelined bait all round the sea from the foot of the cliff to fifty yards offshore. As I fished I saw cormorants, peregrines and gannets but these were the only entertainment. Just as in the River I never had a bite. 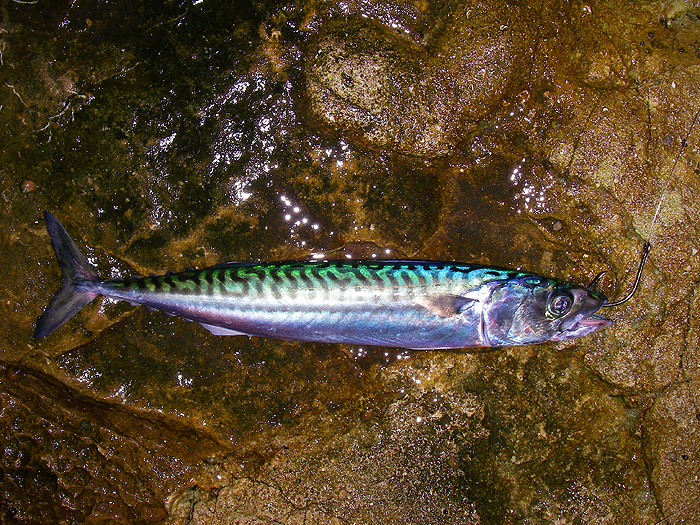 Before I packed in, I picked up the spinning rod and caught one or two more mackerel just for a spot of entertainment (I shook them off back into the sea). So, that was that, two livebaiting efforts without a sniff. However, I KNOW that if I keep at it I will catch some decent fish before long (at least I hope I will) so no doubt on my next trip I'll be standing there again, patient and motionless, as my bait swims off in search of action.